I suppose that is less of a question than a direction hmm? 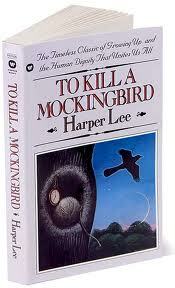 I re-read and reviewed To Kill a Mockingbird for The Classics Club. Check it out! Such a great book, I think I need to re-read it in the next month or so then watch film. Atticus is the best protagonist. It's one of my all time favorites :) I just watched the movie for the first time yesterday! My youngest daughter and I watched it. She was a bit bummed that it was in black & white, ha! Do you find that the more you blog and get around bloggers that the less time you have for re-reads? I use to re-read frequently and now I can't seem to get all the new stuff read. Yes! I've been thinking about that. My schedule isn't very organized at all now and I'm wondering what I can do to clean it up. Thanks for stopping by my blog. I see MUDBOUND is on your currently reading spot. It is an AWESOME READ. Hi Elizabeth, thanks for visiting :) I really enjoyed Mudbound...and thanks for the reminder that it was in my currently reading spot, I had to tweak that a bit since I finished it a while ago! Like you, I read this novel years ago. I think it's about time I read it again, for the pure pleasure of such a great plot and characters! It definitely deserves the label of "timeless classic"! Your take on the book is perfect! I totally agree with you about Atticus -- what a MAN!! I don't think most men have any idea how attractive they become to a woman when they steadfastly stand up for what is RIGHT. I saw the movie version, as well, and thought that Gregory Peck really nailed this character. One thing I especially like about your review is that you've included all of the various covers that have graced this novel. I've never seen amything like this before in a review. Great idea!! Thank you for such a lovely comment Maria :) Atticus Finch is simply the greatest protagonist in the history of books, if you ask me! Gregory Peck was the only choice to play him in the film. What a great role for him. I was so glad to find all of those covers, I love seeing them all together like that. I never did read this in high school. I suppose that I should read it now that I'm a school librarian... Great review! Here's my blog hop post. Yes you should Rina ;) You won't regret it!